Long before Wisconsin Dells ushered in the new wave of indoor waterpark resorts, folks were enjoying the slides and attractions at the World Waterpark in the West Edmonton Mall—even during Alberta's notoriously brutal winters. Many newer water park resorts make various claims about being the largest. But at approximately 200,000 square feet, the Canadian original is still North America's biggest indoor water park. The cavernous World Waterpark offers a bunch of slides and rides to satisfy guests of all ages and thrill-tolerance levels. It claims to have the world's largest indoor wave pool. Other attractions include the Sky Screamer speed slide, the Raging Rapids action river, and Sun Runner, a tube slide that can accommodate single passengers and up top three-passenger rafts. Another highlight is Tropical Typhoon, a "toilet bowl" ride which sends folks swishing around the perimeter of a bowl and then flushes them into a splash pool. Tsunami is a challenging FlowRider surfing attraction. You could try to tackle its continuous wave on a boogie board, but it takes most novices awhile to get the hang of it. On Saturday mornings, World Waterpark offers surfing lessons (on stand-up surfboards). Caribbean Cove is designed for younger kids. The interactive water play structure includes small slides, climbing ladders, sprayers, and a huge water tipping bucket. The Caribbean Cruiser slide is designed for parents and tots to ride together. The park also offers the Dolphin Kiddie Pool. World Waterpark is by far the biggest indoor water park in Canada. But there are others in the country, including Adventure Bay in Windsor, Ontario, Fallsview Indoor Waterpark in Niagara Falls, Ontario, and Great Wolf Lodge Niagara Falls in Ontario. The indoor water park is open to the general public. Discounted rates offered for children under 48 inches and seniors 55 and older. The park also offers discounts such as weekday value passes. As an indoor, climate-controlled facility, World Waterpark is open seven days a week, year-round. 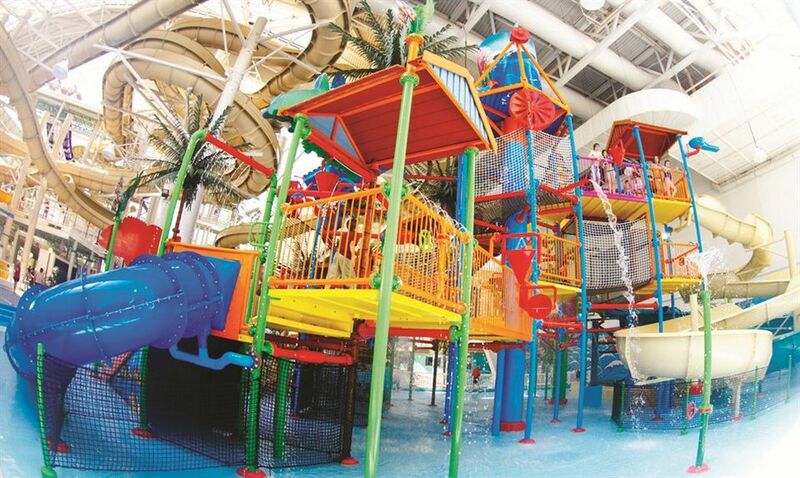 Unlike most other indoor water parks (such as the Great Wolf Lodge resorts), it is not part of a hotel. However, there are two hotels located within the West Edmonton Mall, the Fantasyland Hotel, and the West Edmonton Mall Inn. The water park is located in the West Edmonton Mall on 8882-170 Street in Edmonton, Alberta, Canada. Directions: From Calgary, Alberta (South): Highway 2N, which turns into Gateway Boulevard. Left onto Whitemud Drive. Right onto 170 Street N. Left onto 87 Avenue W. The mall is on the right. Visitors from outside the area could fly into the Edmonton International Airport. The park offers two food locations. The Beachview Bar and the Coconut Grove offer similar menus and feature quick bites such as hamburgers, pizza, and corndogs. The West Edmonton Mall has many restaurants at a variety of price points. The West Edmonton Mall also includes the indoor amusement park, Galaxyland, indoor mini golf, a skating rink, bowling, an aquarium, and other attractions. Of course, there are also scads of shops.